Product categories of Magnetic Contact, we are specialized manufacturers from China, Magnetic Contact, Negative Contact suppliers/factory, wholesale high-quality products of Positive Contact R & D and manufacturing, we have the perfect after-sales service and technical support. Look forward to your cooperation! 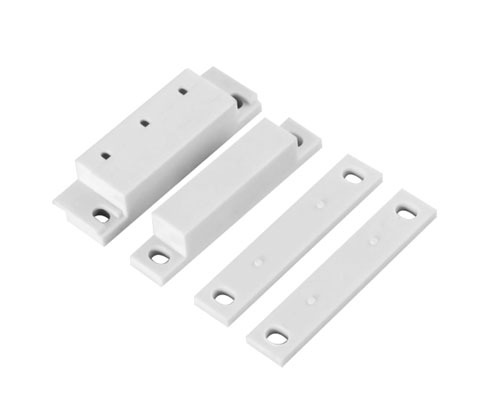 Magnetic Contact is a kind of security alarm device, consists of two parts, wireless transmitter and permanent magnets, used to detect the door, window and drawer is illegally open or mobile, divided into wireless magnetic door, gate magnetism, cable magnetic door 3 kinds. Magnetic Contact is a security alarm system, door magnetic, window magnetic (same principle, different shape). door/window magnets are not easy to see if you don't pay attention to them.So-called magnetic magnetic door/window is short for window door magnetic Switch and magnetic switch, consists of two parts: small parts for permanent magnets, inside has a permanent magnet, used to generate a constant magnetic field, the magnetic door is the main body, inside it there is a normally open type dry reed pipe, when the permanent magnet and reed pipe very close (less than 5 mm), door Magnetic Sensor is in a state of work waiting for you, when permanent magnet after leaving the dry reed pipe length, in a normally open state.Magnet and reed pipe respectively installed on the frame (frame) and the door leaf (casement), basically all is embedded installation (also have a surface type installation), so it's not the industry generally is not able to notice these.You can open the ledger of outside the door and window, look at the household outside door frame at the top and the sash of the window, can see the rounded, usually in white components, and in fact this is the so-called door magnetic, magnetic window.